Cathleen Jia is an up and coming designer who creates beautiful cocktail and evening dresses. I had the privileged of working with Cathleen Tan, the founder of this fashion house, in my Garden Vintage Photoshoot where her purple dress “Moonlight Kiss” was featured. I then was lucky enough to shoot her second collection “Premiere” as well – I did the hair and make up for the model wearing all her amazing designs. All her dresses are hand made from exquisite silk and carefully selected lace. It really looks like old hollywood come to life! To top it off, she’s just a lovely girl who is living her dream and wants t make every girl feel beautiful. I sent her some questions to get a better insight into her life and hopefully her words will inspire you to go and make your dreams a reality! 1. 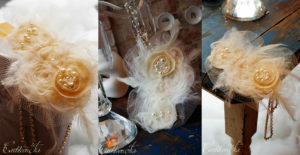 Cathleen Jia Designs has launched! Can you tell us what you’re all about your label and what it represents? Cathleen Jia is a Melbourne based fashion house specialising in silk evening dresses. Since I was little I loved making dresses for my dolls using scrap fabrics and decorating my own garments. As I grew up, the passion has turned into a career. I love vintage styles and often redesign all my op shop finds. Cathleen Jia is all about that! Greatly influenced by the 1920’s to the 1940’s but with a modern take on shapes ans silhouettes. 2. Where do you draw your inspiration and influence from? I absolutely love laces and hand bead embellishments. I get inspire from beautiful textiles. I often find amazing fabrics or laces and I design based on that. Also my love for 1920’s to 1940’s styles, something about that period in time the styles are just so timeless. 3. What has been the highlight so far in your journey. As an emerging designer, everything is not so easy to start with. Luckily I have wonderful support around me and EVERYONE has been incredibly sweet and loving my designs. The highlight so far was definitely my launch which happened recently at Domain flowers. It was set up like a salon parade, when the model walked out in the first dress “Miss Audrey”in chartrese, the room felt silent and people just stopped to admire. I felt a rush of emotion over me, because the model looked amazing and everyone had their eyes on my dress. It was like all my hard work finally paid off and people do like my stuff. I would love to take Cathleen Jia internationally, but still a Melbourne base fashion label. And also eventually do a Cathleen Jia bridal range, with classic custom designs. 5. What advice do you have to up and coming designs? Patience, persistence, passion. starting a label is hard work! Most of the time you’ll need to work on a full time or side job to keep the funds up. Those late night sewings, sleepless nights, I know it sounds cliche but passion keeps you going. Be smart and have a clear direction for your label. Utilize social media, do your own PR on social media if you don’t have the funds to hire a pro, it is HUGE for an emerging designer. Success doesn’t come over night, but if you work hard and be smart about it, I promise it will all pay off. With spring racing just around the corner, this is the perfecgt prize! Goodluck ladies!